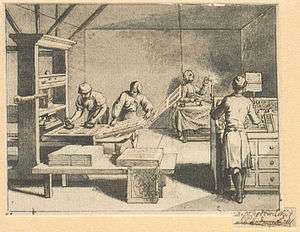 Screen printing is a form of stencilling that first appeared in a recognizable form in China during the Song Dynasty (960–1279 AD). It was then adapted by other Asian countries like Japan, and was furthered by creating newer methods. Early in the 1910s, several printers experimenting with photo-reactive chemicals used the well-known actinic light–activated cross linking or hardening traits of potassium, sodium or ammonium chromate and dichromate chemicals with glues and gelatin compounds. Roy Beck, Charles Peter and Edward Owens studied and experimented with chromic acid salt sensitized emulsions for photo-reactive stencils. This trio of developers would prove to revolutionize the commercial screen printing industry by introducing photo-imaged stencils to the industry, though the acceptance of this method would take many years. Commercial screen printing now uses sensitizers far safer and less toxic than bichromates. Currently there are large selections of pre-sensitized and "user mixed" sensitized emulsion chemicals for creating photo-reactive stencils. 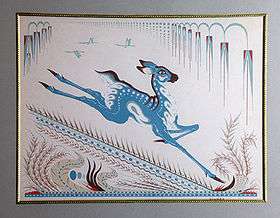 A group of artists who later formed the National Serigraphic Society coined the word Serigraphy in the 1930s to differentiate the artistic application of screen printing from the industrial use of the process. "Serigraphy" is a compound word formed from Latin "sēricum" (silk) and Greek "graphein" (to write or draw). Credit is generally given to the artist Andy Warhol for popularising screen printing as an artistic technique, identified as serigraphy, in the United States. Warhol was supported in his production by master Screen Printer Michel Caza, a founding member of Fespa, and is particularly identified with his 1962 depiction of actress Marilyn Monroe, known as the Marilyn Diptych, screen printed in garish colours. Sister Mary Corita Kent, gained international fame for her vibrant serigraphs during the 1960s and 1970s. 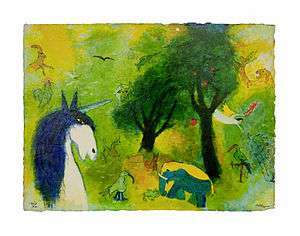 Her works were rainbow colored, contained words that were both political and fostered peace and love and caring. 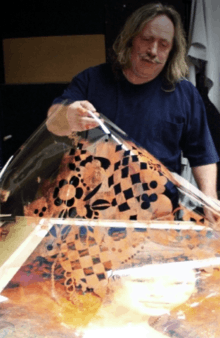 American entrepreneur, artist and inventor Michael Vasilantone started to use, develop, and sell a rotatable multicolour garment screen printing machine in 1960. Vasilantone later filed for patent on his invention in 1967 granted number 3,427,964 on February 18, 1969. The original machine was manufactured to print logos and team information on bowling garments but soon directed to the new fad of printing on T-shirts. The Vasilantone patent was licensed by multiple manufacturers, the resulting production and boom in printed T-shirts made this garment screen printing machine popular. Screen printing on garments currently accounts for over half of the screen printing activity in the United States. In June 1986, Marc Tartaglia, Marc Tartaglia Jr. and Michael Tartaglia created a silk screening device which is defined in its US Patent Document as, "Multi-coloured designs are applied on a plurality of textile fabric or sheet materials with a silk screen printer having seven platens arranged in two horizontal rows below a longitudinal heater which is movable across either row." This invention received the patent number 4,671,174 on June 9, 1987. Graphic screenprinting is widely used today to create mass or large batch produced graphics, such as posters or display stands. Full colour prints can be created by printing in CMYK (cyan, magenta, yellow and black ('key')). Screen printing lends itself well to printing on canvas. Andy Warhol, Arthur Okamura, Robert Rauschenberg, Roy Lichtenstein, Harry Gottlieb and many other artists have used screen printing as an expression of creativity and artistic vision. A screen is made of a piece of mesh stretched over a frame. The mesh could be made of a synthetic polymer, such as nylon, and a finer and smaller aperture for the mesh would be utilized for a design that requires a higher and more delicate degree of detail. For the mesh to be effective, it must be mounted on a frame and it must be under tension. 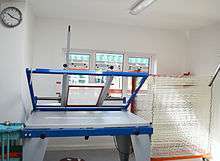 The frame which holds the mesh could be made of diverse materials, such as wood or aluminum, depending on the sophistication of the machine or the artisan procedure. The tension of the mesh may be checked by using a tensiometer; a common unit for the measurement of the tension of the mesh is Newton per centimeter (N/cm). Before printing occurs, the frame and screen must undergo the pre-press process, in which an emulsion is 'scooped' across the mesh and the 'exposure unit' burns away the unnecessary emulsion leaving behind a clean area in the mesh with the identical shape as the desired image. The surface to be printed (commonly referred to as a pallet) is coated with a wide 'pallet tape'. This serves to protect the 'pallet' from any unwanted ink leaking through the screen and potentially staining the 'pallet' or transferring unwanted ink onto the next substrate. Next, the screen and frame are lined with a tape. The type of tape used in for this purpose often depends upon the ink that is to be printed onto the substrate. These aggressive tapes are generally used for UV and water-based inks due to the inks' lower viscosities. The last process in the 'pre-press' is blocking out any unwanted 'pin-holes' in the emulsion. If these holes are left in the emulsion, the ink will continue through and leave unwanted marks. To block out these holes, materials such as tapes, speciality emulsions and 'block-out pens' may be used effectively. There are three common types of screen printing presses. The 'flat-bed', 'cylinder', 'rotary'. Most screens are ready for re-coating at this stage, but sometimes screens will have to undergo a further step in the reclaiming process called dehazing. This additional step removes haze or "ghost images" left behind in the screen once the emulsion has been removed. Ghost images tend to faintly outline the open areas of previous stencils, hence the name. They are the result of ink residue trapped in the mesh, often in the knuckles of the mesh (the points where threads cross). A macro photo of a screen print with a photographically produced stencil. The ink will be printed where the stencil does not cover the substrate. The original image is created on a transparent overlay, and the image may be drawn or painted directly on the overlay, photocopied, or printed with a computer printer, but making so that the areas to be inked are not transparent. A black-and-white positive may also be used (projected onto the screen). However, unlike traditional plate-making, these screens are normally exposed by using film positives. A screen must then be selected. There are several different mesh counts that can be used depending on the detail of the design being printed. Once a screen is selected, the screen must be coated with emulsion and put to dry in a dark room. Once dry, it is then possible to burn/expose the print. The overlay is placed over the screen, and then exposed with a light source containing ultraviolet light in the 350-420 nano meter spectrum. The screen is washed off thoroughly. The areas of emulsion that were not exposed to light dissolve and wash away, leaving a negative stencil of the image on the mesh. Another advantage of screen printing is that large quantities can be produced rapidly with new automatic presses, up to 1800 shirts in 1 hour. The current speed loading record is 1805 shirts printed in one hour, documented on 18 February 2005. Maddie Sikorski of the New Buffalo Shirt Factory in Clarence, New York (USA) set this record at the Image Wear Expo in Orlando, Florida, USA, using a 12-colour M&R Formula Press and an M&R Passport Automatic Textile Unloader. The world speed record represents a speed that is over four times the typical average speed for manual loading of shirts for automated screen printing. A caviar bead is a glue that is printed in the shape of the design, to which small plastic beads are then applied – works well with solid block areas creating an interesting tactile surface. Cracking ink effect is when the ink produces an intentional cracked surface after drying. Discharge ink is used to print lighter colours onto dark background fabrics, they work by removing the dye of the garment – this means they leave a much softer texture. The cons with this process is that they are less graphic in nature than plastisol inks, and exact colours are difficult to control. One of the pros of using this process is they are especially good for distressed prints and under-basing on dark garments that are to be printed with additional layers of plastisol. It adds variety to the design or gives it that natural soft feel. Expanding ink, or puff, is an additive to plastisol inks which raises the print off the garment, creating a 3D feel and look to the design. Mostly used when printing on apparel. Flocking consists of a glue printed onto the fabric and then flock material is applied for a velvet touch. Foil is much like flock, but instead of a velvet touch and look it has a reflective/mirror look to it. Although foil is finished with a heat press process it needs the screen printing process in order to add the adhesive glue onto the material for the desired logo or design. Four-colour process is when the artwork is created and then separated into four colours (CMYK) which combine to create the full spectrum of colours needed for photographic prints. This means a large number of colours can be simulated using only 4 screens, reducing costs, time, and set-up. The inks are required to blend and are more translucent, meaning a compromise with vibrancy of colour. Gloss ink is when a clear base laid over previously printed inks to create a shiny finish. Mirrored silver is a highly reflective, solvent-based ink. Nylobond is a special ink additive for printing onto technical or waterproof fabrics. Plastisol is the most common ink used in commercial garment decoration. Good colour opacity onto dark garments and clear graphic detail with, as the name suggests, a more plasticized texture. This print can be made softer with special additives or heavier by adding extra layers of ink. Plastisol inks require heat (approx. 150 °C (300 °F) for many inks) to cure the print. PVC and Phthalate Free is relatively new breed of ink and printing with the benefits of plastisol but without the two main toxic components. It also has a soft texture. Suede ink is a milky coloured additive that is added to plastisol. With suede additive you can make any color of plastisol have a suede feel. It is actually a puff blowing agent that does not bubble as much as regular puff ink. The directions vary from manufacturer to manufacturer, but generally up to 50% suede can be added to normal plastisol. these penetrate the fabric more than the plastisol inks and create a much softer feel. Ideal for printing darker inks onto lighter coloured garments. Also useful for larger area prints where texture is important. Some inks require heat or an added catalyst to make the print permanent. High Build is a process which uses a type of varnish against a lower mesh count with many coats of emulsion or a thicker grade of emulsion (e.g., Capillex®). After the varnish passes through to the substrate, an embossed-appearing, 'raised' area of varnish is created. When cured at the end of the process, the varnish yields a Braille effect, hence the term 'High Build'. Screen with exposed image ready to be printed. In screen printing on wafer-based solar photovoltaic (PV) cells, the mesh and buses of silver are printed on the front; furthermore, the buses of silver are printed on the back. Subsequently, aluminum paste is dispensed over the whole surface of the back for passivation and surface reflection. One of the parameters that can vary and can be controlled in screen printing is the thickness of the print. This makes it useful for some of the techniques of printing solar cells, electronics etc. Solar wafers are becoming thinner and larger, so careful printing is required to maintain a lower breakage rate, though high throughput at the printing stage improves the throughput of the whole cell production line. 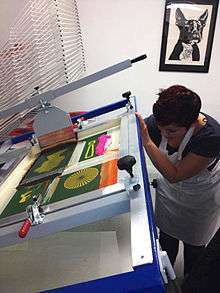 A development of screen printing with flat screens from 1963 was to wrap the screen around to form a tube, with the ink supply and squeegee inside the tube. The resulting roller rotates at the same speed as the web in a roll-to-roll machine. The benefits are high output rates and long rolls of product. This is the only way to make high-build fully patterned printing/coating as a continuous process, and has been widely used for manufacturing textured wallpapers. ↑ Sheng, Angela (1999). "Review: Why Ancient Silk Is Still Gold: Issues in Chinese Textile History". Ars Orientalis. 29. JSTOR 4629553. ↑ "History's Influence on Screen Printing's Future | ScreenWeb". screenweb.com. 2006-05-04. Retrieved 2012-11-15. ↑ "screenprinting". Homepage.usask.ca. Retrieved 2012-11-15. ↑ "Serigraphy, screen prints, art". Home.earthlink.net. Retrieved 2012-11-15. ↑ "Serigraphy | Define Serigraphy at Dictionary.com". Dictionary.reference.com. Retrieved 2012-11-15. 1 2 "Printer's National Environmental Assistance Center Official website". Retrieved 2007-09-15. 1 2 "patft » Page 1 of 1". Patft.uspto.gov. 2010-08-26. Retrieved 2012-11-15. 1 2 "Industry Analysis". Sgia.org. Retrieved 2012-11-15. ↑ "Multicolor silk screen printing machine with moveable heating carriage". ↑ "Putting Your Reclaiming Tools to Work: Reclaiming Screens to Maximize Your Profits (Part 2)". Signindustry.com. Retrieved 2013-11-27. ↑ "The M&R Companies :: News - M&R-and-Maddie-Sikorski-set-World-Record". Mrprint.com. 2005-02-18. Retrieved 2012-11-15. 1 2 "Screen printing - Front End Omron Wafer Based PV". Omron-semi-pv.eu. Retrieved 2012-11-15. Chieffo, Clifford T.: Silk-Screen as a Fine Art : A Handbook of Contemporary Silk-Screen Printing - Reinhold, New York, 1967. Jacob I. Biegeleisen: Screen Printing: A Contemporary Guide. – New-York, 1972. Andy MacDougall: Screen Printing Today: The Basics. – ST-Media, Cincinnati, 2008. Guido Lengwiler: A History of Screen Printing. – ST-Media, Cincinnati, 2013. Steven Abbott: How to be a Great Screen Printer – Macdermid Autotype, Wantage, 2008. 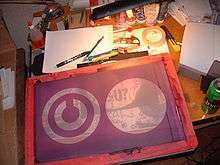 Wikimedia Commons has media related to Screen printing.